When the first chill of autumn arrives, I start thinking about cooking some comfort foods. 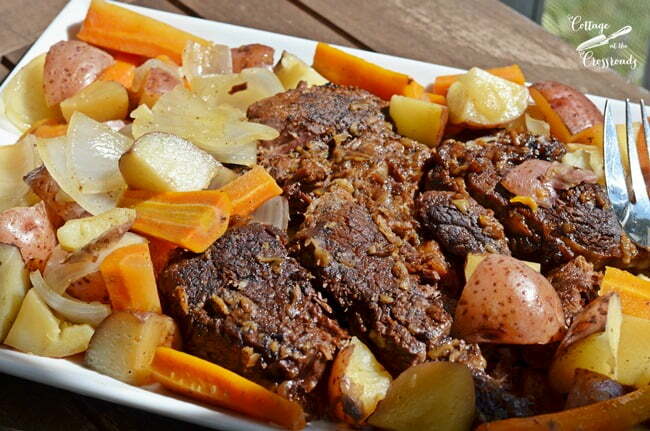 And the recipe I turn to frequently is my mom’s beef pot roast recipe. 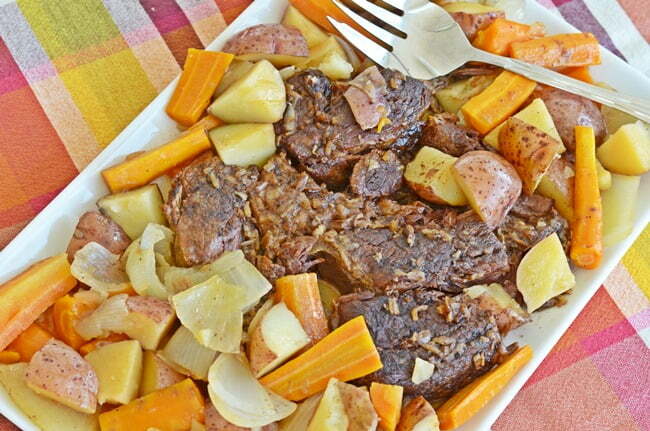 It is a traditional pot roast made with a few simple ingredients that are cooked in the oven. There’s nothing fancy or complicated about it. It’s just a matter of technique and timing that makes the roast melt in your mouth and elicits compliments from even the pickiest eaters. I’m sharing this recipe as part of a comfort food blog hop today hosted by Maryann from Domestically Speaking and Krisitin from My Uncommon Slice of Suburbia. I can’t wait to visit all the links below because all of these foods in the graphic look so darn delicious! 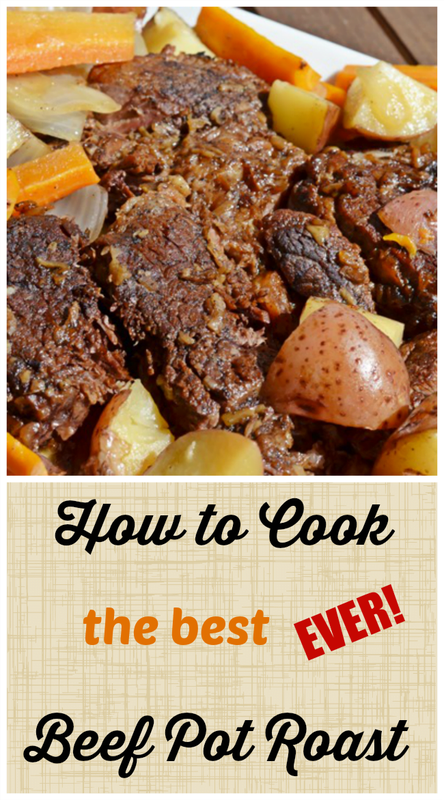 But first, let me tell you how to make the best pot roast EVER! This is a photo of my mom and me taken many, many years ago. For as long as I remember, my mom made a pot roast for most Sunday dinners, and it was always her go-to recipe whenever guests were coming to eat at our house. The roasts that we had growing up came from cattle that my father raised. Because they was grass-fed, the beef was always tender and delicious. And when my mother got ready to make a roast, she always pulled out this oval roaster. A number of years ago, I was bestowed with this “magic pot” as I call it. 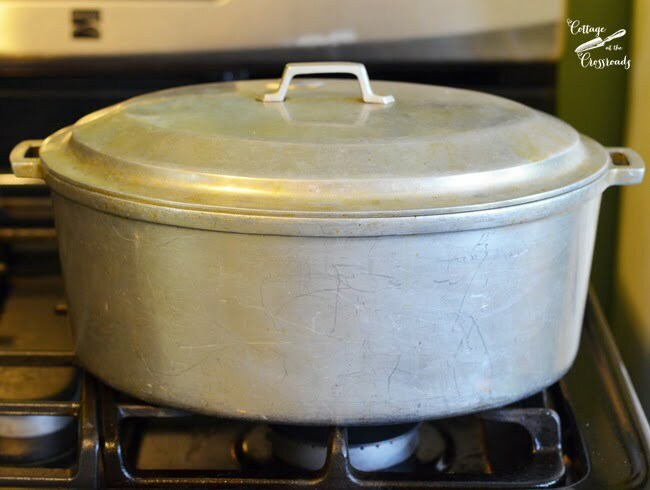 When my mother was teaching me how she made her pot roast, I asked her how she acquired the pot. She told me that a traveling salesman came to my parent’s home back in the 1940s, shortly after they were married. And Daddy purchased the entire set of Miracle Maid pots from the man. I don’t know what happened to the other pots, but this one survived the years. So if you ever come across one of these pots, grab it because it is an incredible cooking machine! But don’t worry. You will be able to cook a darn good roast as long as you have a heavy bottomed pot with a lid or a dutch oven and follow my ( and my mom’s) instructions. Years ago, I tried making a pot roast in the slow cooker, but I was never satisfied with the results. I just prefer the taste that you get when you slow cook a roast in the oven the way my mom always did it. 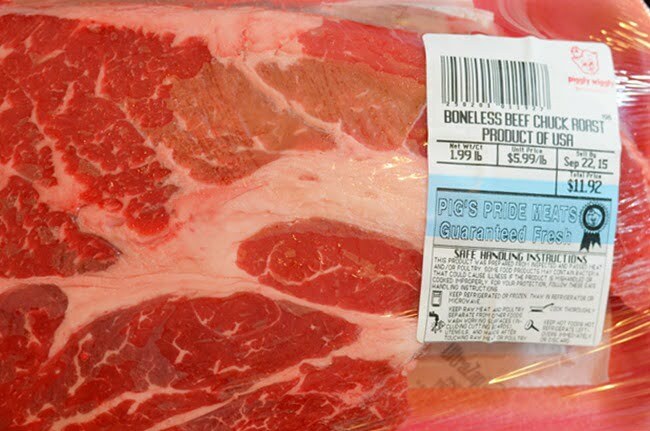 My preferred cut of meat is a chuck roast with plenty of fat included. I usually buy a 3 to 4 pound of roast, but I went with a smaller one since I was cooking for just the two of us. 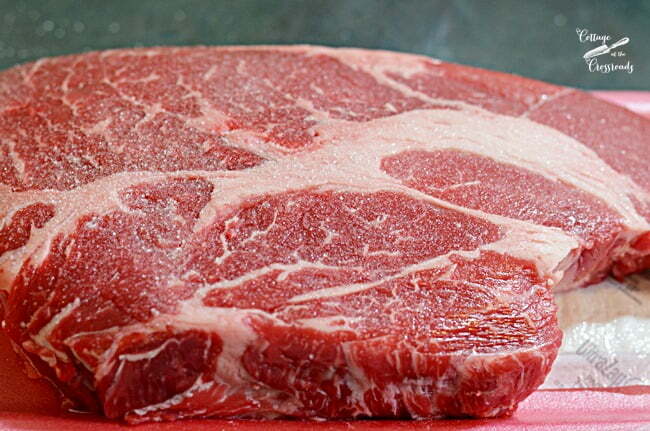 Next, bring the piece of meat to room temperature (about 15 min.) and then salt both sides. I don’t add pepper at this point as pepper will burn in the next step. Add 3 tablespoons of vegetable oil to the pot and turn the heat up to medium high on the stove top. Although I usually cook with olive oil, I use vegetable oil for this step because it has a higher smoking point. Get the oil nice and hot and add the roast. What you want to do is to sear the top and bottom and sides of the roast, sealing in the juices. 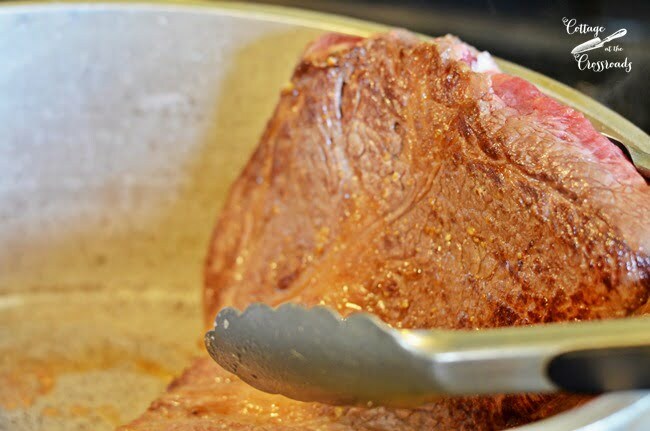 Use tongs to turn the roast rather than a fork so that you don’t lose any of those juices. I tried to get a photo of this step but it’s real hard to hold a camera and tongs at the same time! Once all sides have been browned, turn off the heat. 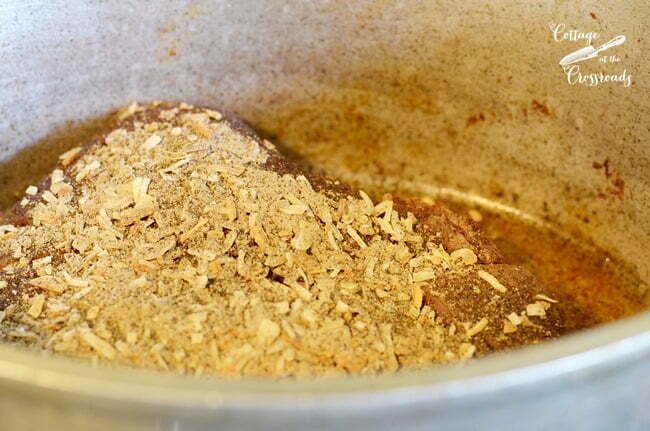 Here’s my mom’s secret ingredient to a tasty beef roast. 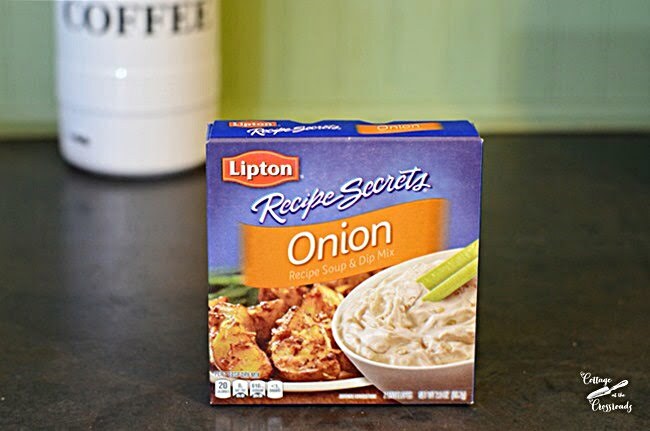 Sprinkle one package of Lipton onion soup onto the roast and then add 1 1/2 cup of water, pouring the water on top of the roast to distribute some of the onion soup mix down into the pot. Then put the lid on the pot and put it in a 300 degree oven and cook it for 2 hours. 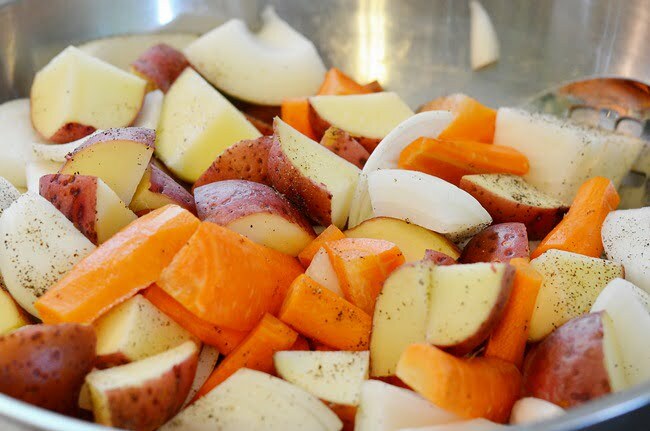 In the meantime, wash and cut some red potatoes into small chunks, quarter a few onions, and peel and cut some carrots into 2 inch lengths. The amount of the veggies depends on how large your roast is and how many people you’re feeding. Add salt and pepper liberally to the vegetables and turn to mix. Remove the pot from the oven and transfer the roast to a platter. At this point, it will not be fall apart tender, but don’t worry about that! Put the vegetables down into the pot with the juices and mix it all together to coat those veggies with that delicious drippings. Nestle the roast back into the pot with the vegetables, put on the lid, and put the roast back into the oven. Turn up the heat to 350 degrees and cook for an additional hour or until the veggies are done. When ready to serve, put the roast on a platter and surround it with the vegetables. To make a gravy with the drippings in the pot, add 1 tablespoon of cornstarch with 3 tablespoons water and add that to the droppings. Turn on the stove top to medium high and whisk the drippings and cornstarch mixture together until the drippings thicken. My mother no longer cooks a roast like this, but she is always happy when I do. 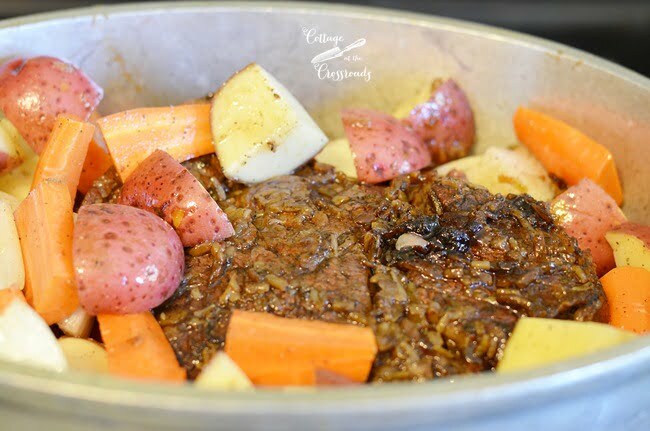 This delicious beef pot roast is the ultimate comfort food dish for us, and I’m glad she taught me how to make it. And you’ll never go wrong serving it to your family or your guests, either! A delicious, melt in your mouth beef pot roast cooked the traditional way in the oven, and the drippings make a flavorful gravy, too. Bring the roast to room temperature for 15 minutes and sprinkle 2 tablespoons salt over the roast. Heat 3 tablespoons vegetable oil in a heavy bottom dutch oven over medium high heat on the stove top. Sear the bottom, top, and sides of the roast and then turn off the heat. Sprinkle 1 package of Lipton dry onion soup mix over the top of the roast. Pour the water over the onion soup mix and the roast. Add the lid to the dutch oven and cook in a 300 degree oven for 2 hours. Remove the roast from the pot. Add the vegetables to the drippings and stir to coat. Nestle the roast back in the pot with the vegetables. Place back in the oven and turn up the heat to 350 degrees. Cook for 1 hour or until the vegetables are done. Remove the roast and vegetables from the dutch oven but leave the drippings in the pot. Mix 3 tablespoons water with 1 tablespoon cornstarch and whisk into the drippings in the pot. Heat over medium-high until the drippings thicken. The roast and vegetables are equally good when heated over the next day! 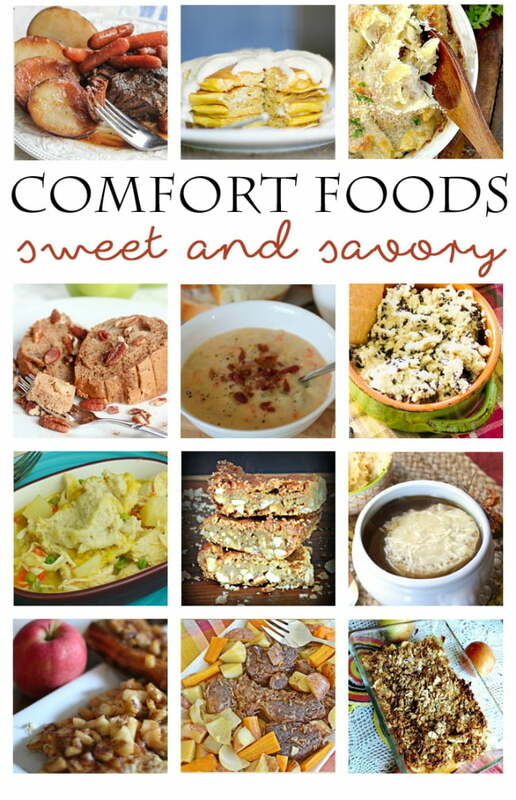 Be sure to check out the other comfort food recipe links below. You know they must all be winners, too! I am making this for the second time. So much better in the dutch oven than in the slow cooker! There’s nothing I love more on a winter day then a yummy post roast. Yours looks delicious! I am going to have to try this recipe out! Thanks so much for sharing this recipe and your lovely story, Jane. That picture of you and your mother is awesome – you are beautiful and this recipe sounds AMAZING! MMMMMMmmm…This is making my mouth water. I can only imagine how delicious it tastes. 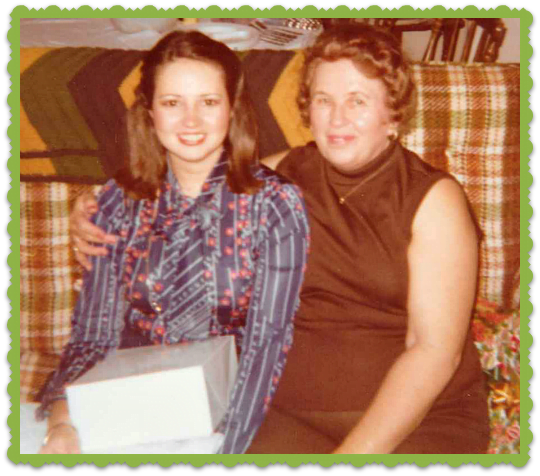 Thanks so much for sharing a small piece of your family history. The picture of you and your mom is priceless. It’s always so nice to have such a great family recipe with so many memories behind it. Thanks so much for sharing! This looks so delicious and brings back so many memories. This is how my Mom used to make her Sunday pot roast. I haven’t made one in eons. And the weather has turned chilly here. I am making this tomorrow, Sunday. Thank you. Jane that looks amazing and I bet your house smelled so good! How fun to see the photo of you and your Mom. What a neat recipe. I know my family would love it! Pinning! I love the photo, Jane! My sister makes patriots this way too! I must try it as soon as possible!! Between you & Beth, I can’t get pot roast out of my head! Thanks Julie! Football and pot roast go hand in hand! So sorry Jane I just saw the name of the roaster. Have a wonderful weekend. Love the picture with your mom. My mom wrote down all of her special recipes and gifted them to us. Such a treasure to have them in her handwriting. I have a few of her pots and pans that I enjoy using also. Please could you tell me the name of your mom’s roaster? Don’t you just love the smell of a roast cooking on a cool fall day? I use the same ingredients, but I cook mine in the oven in a browning bag. No mess to clean up, and all the jucies stay in the bag. When done, I open the bag and pour one jar of beef gravy over the roast, and let it come to a bubble in the oven. It’s deicious, and my family loves it. I love the picture of you and your Mom. You are so blessed to still have her. That’s such a good tip about using the browning bag, Kathy! I make mine using the soup mix too sometimes. Great recipe Jane! I agree, Dawn. The soup mix does add such rich flavor! Hooray for the chuck roast? It’s the best, right? I love that we both thought of the same thing for our comfort foods. Sunday dinner at mama’s house was ALWAYS this meal for me too. It is so good! Yours looks heavenly, Jane, and I LOVE that pic of you and your mom! Thanks Beth! I’m coming over to see how you cook a roast in Alabama!